This site is best viewed as a full page. 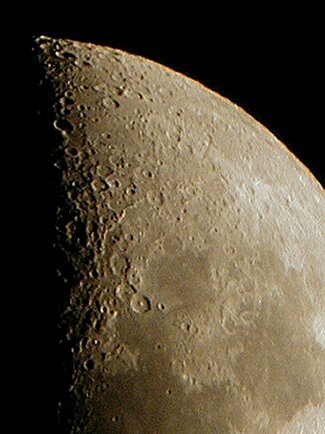 This is a short web page dedicated to all those cold nights spent outside with my digital camera and telescope. It's also my first attempt at web page designing! None of the photos are in any specific order and none are dated either!! Anyway, enjoy! This hyperlink, Eclipse 2006 will take you to another page of mine detailing the total solar eclipse of 29 March 2006. 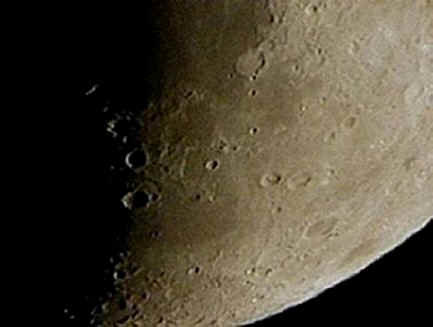 These images of the moon were taken using a 4.5 inch reflecting telescope and a standard 1.3 mega pixel digital camera. The telescope, equipped with a guidance system was constantly moving (slewing) in relation to the moon. With no camera adapter, this meant holding the camera to the eyepiece of the scope, focusing and then taking the picture. This was really trial and error. As you can see the pictures are not perfect but they're not bad - for a beginner. By the way, I prefer to print all of my best pictures on photo quality paper. After all, if you're going to spend so many cold nights out just to shoot a good picture then you may as well compliment your efforts with the perfect finishing touch. On a final note these pictures have been digitally altered - it's not cheating really - the details show up slightly better when altered, rather than just left alone... that's the fun of digital cameras. It's worth noting that even if you're not particularly fussy about the Moon or astronomy in general, grab a pair of binoculars and you'll see a fair amount of detail on the Moon not unlike the pictures on this page. If you like what you've seen so far and you are now a little curious about the great above, for a bit of advice, see the tips below. It's a good idea to have a pocket book just to guide you around the heavens. You can spend a small fortune on high tech equipment but the bottom line is that you don't NEED expensive equipment. As mentioned before - a good book, binoculars and patience is more than enough to start with. These days most telescopes are supplied with a motor which works in conjunction with a handheld database. I would suspect that this sort of technology might put some people off. When using the torch it is important to remember that on a dark night your eyes take about 10 minutes to become accustomed to the dark. You switch on your torch and your 'night vision' is ruined. So what's the solution? Simple, you cover the front of your torch with red transparent plastic so when you use the torch you get gentle red light instead of a bright white beam. It's quite scientific why red light does not ruin your night vision so I'll not try to explain! No one is too sure as to how the Moon was formed but the 'big splash' theory is gaining increasing popularity. This theory describes an object roughly the size of Mars colliding with the young Earth causing a cataclysmic explosion resulting in the destruction of the impacting object and near destruction of the Earth itself. The material from the destroyed world settled around the Earth to form a disc, coagulating over time eventually forming the Moon. 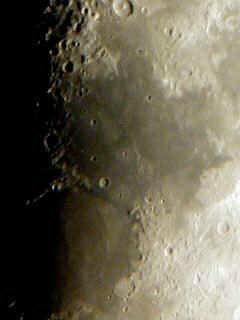 The large dark patches are known as 'Maria' (singular 'Mare') and were caused by very large objects impacting with the Moon. These impacts were powerful enough to shatter the surface and with the help of Earth's gravity, lava welled up to form these 'seas', then cooling to become the dark plains. 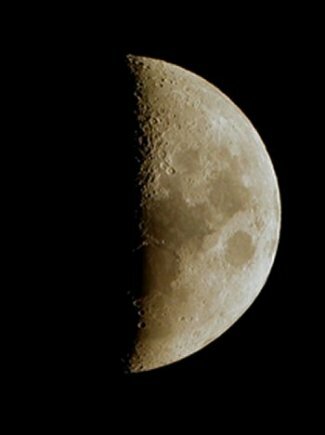 Since the Moon does not experience weather the craters do not erode like those on Earth but they can be erased by meteorites causing 'fresh' craters. Feel free to visit another page of mine to view my Astronomy Photo Album.